If anything is going to make me clucky (don't get excited mum) it's a little boy's room decked out in duck egg blue & smoky grey. I'm calling it my new favourite colour combination! So modern. In fact, anything pastel teamed with a pale grey is a delightfully fresh look. 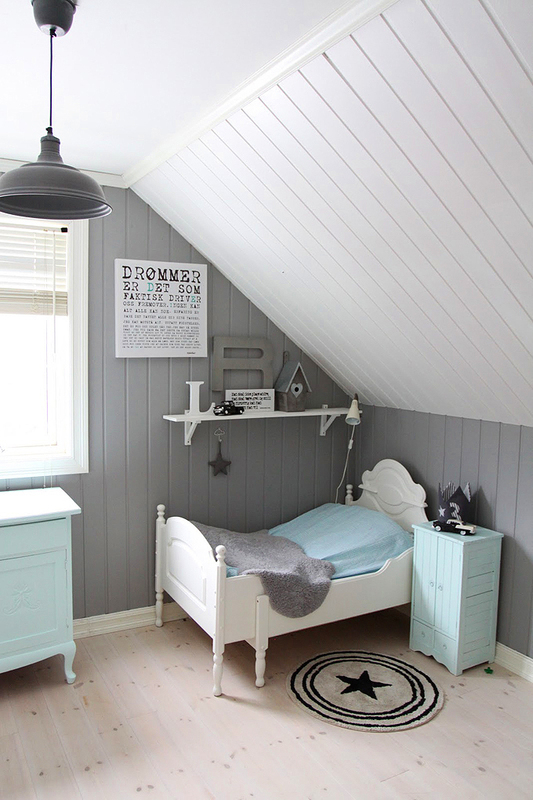 When I was little, I had a powder pink & grey room, and let me tell you, I loved it! A friend of mine just had a baby and insisted on all grey clothes... it's like the new neutral boy/girl colour and I love having the alternative choice to unisex-yellow! Here, here! I've been carrying around two fabric samples in my bag for the last week and the colours are... (drumroll please) duck egg blue and silver grey. And ps. We had a pastel pink and light grey trim on the entire inside of our house. It was the eighties. I'm sorry but it has ruined me for life. oh i love this combination. Ive been looking for the perfect grey paint colour.... Any recommendations? ParisandPearls - Bunnings is a good start. Dulux, Taubmans etc all make DOZENS of greys... Taubmans Silver Treasure is nice. I have a swatch here as I almost painted Anoushka's bed grey(!). Quite pale though... Good luck! So interesting duck egg blue and grey together.... Soothing and playful at once. Great post! I just love to talk color. Stopping by to visit your blog and always enjoy seeing what's up at Table Tonic. It looks diff did you do a new side thingy?? Neat. One of the best~ever classic, yet always fresh, colour combos. Duck egg blue is just a dreamy colour - perfectly deliciously so. I love my children - but step to the side kids because this is a colour combination that has my name written all over it.